As institutions of assimilation, Indian boarding schools forbade indigenous children from speaking their mother tongue. Thousands of Native people who attended such schools between the 1880s and early 1930s came to associate their first languages with shame and punishment. As adults, many of them refused to teach their languages to their own children, hoping to protect them from incurring shame at being “Indian.” This situation created a language gap of two or even three generations in many families. Perhaps because she attended English-speaking schools for only about four years, then married a fellow tribal member, John Walker, and settled near her childhood home, Theresa Walker retained her fluency in the White Clay language. Her second husband, Andrew Lamebull, also spoke it fluently. For smaller tribes like the A’aninin, who numbered around six hundred people at the beginning of the twentieth century, only a few lifelong speakers remained at the century’s end. After her ten children grew up, Theresa Walker Lamebull often longed to talk with someone who spoke the White Clay language. 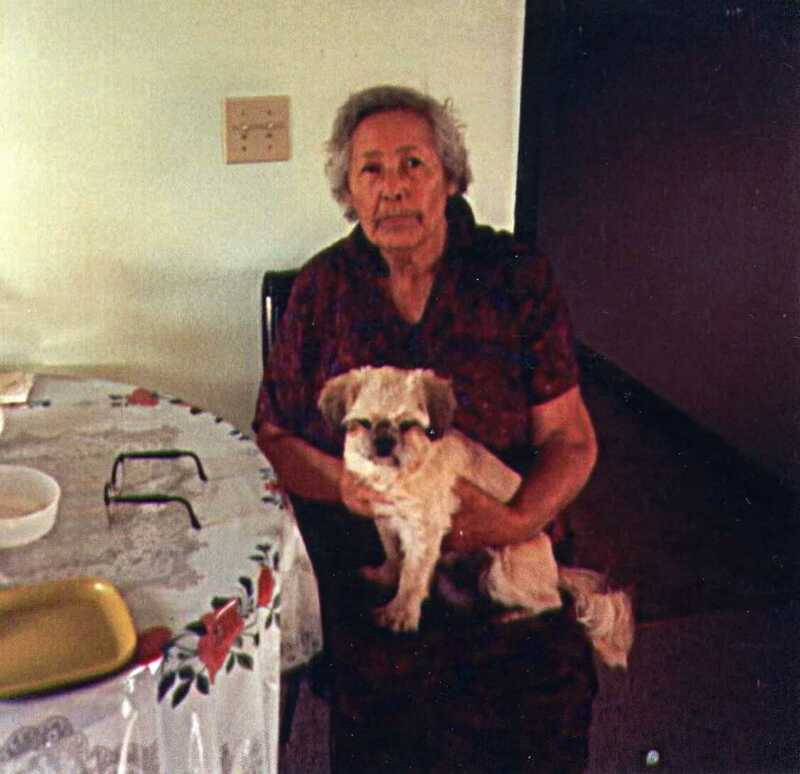 She visited the senior center to speak with other elders and shared her knowledge with the reservation schools’ bilingual programs in the 1970s. Inconsistent funding and the scarcity of fluent speakers, however, made it difficult to establish lasting language programs. Then, in the late 1990s, Fort Belknap College received a grant to develop a mentorship program, Speaking White Clay, which paired elders like Theresa Walker Lamebull with new learners. Lamebull traveled seventy miles twice a week to the tribal college to teach. One of her students was educator Terry Brockie, who had begun studying A’aniiih with his traditional grandmother, Madeline Colliflower. Brockie understood that the endeavor was about more than learning words and phrases. It was about regaining what had been nearly lost for all time: their identity as White Clay people. Theresa Lamebull was essential to that process. “She is one of the few keepers of our way of life, our traditional way of life,” he told the Great Falls Tribune in 2005. Realizing that their elderly mentors would not always be around, younger adult students in the Speaking White Clay program committed themselves to preserving the language. The tribal education department had previously collected stories from elders, but those memories were written in English. A few older audiotapes existed, but without translations into English. Then Brockie discovered a new technology—the “Phraselator,” a device originally developed for military use. With Brockie’s help, Lamebull recorded hundreds of A’aniiih words and phrases and their English definitions into the Phraselator, teaching Brockie the more complex aspects of the White Clay language while sharing tales of the old way of life and the tribe’s history. The more he learned, the more Brockie realized the responsibility members of his own generation had to teach their culture to future generations. Although reservation-based Head Start preschools had tried to incorporate Native languages, funding for bilingual programs waxed and waned over the years, making it impossible to teach children the language. In 2003, Brockie’s classmate from the Speaking White Clay program, Lynette Chandler, developed a K-8 White Clay immersion school. Funded by private grants, the immersion school’s first class of graduates not only speak their ancestral language, but have excelled in other academic subjects as well, including English. With over one hundred digital audio recordings of elders like Lamebull, Chandler and her husband, Sean, are now creating a new digital curriculum for young speakers, including White Clay language apps for iPhones and iPods. Brockie is helping to develop a user-friendly A’aniiih dictionary. Boswell, Evelyn. “MSU Grads Preserve a Native Language, Keep Tribal Philosophies Alive.” MSU News Service (online), December 4, 2008. . Retrieved February 13, 2014. Brockie, Terry. Personal correspondence with Laura Ferguson, February 18, 2014. Capriccioso, Rob. “The Phraselator II.” The American: The Online magazine of the American Enterprise Institute. Posted October 9, 2007. . Accessed February 11, 2014. Ivanova, Karen. “Revitalizing Native Tongues.” Great Falls Tribune, April 14, 2002, 1. Ogden, Karen. “Gros Ventre Woman, 110, A Living Bridge to the ‘Buffalo Days’.” Great Falls Tribune, September 19, 2006. Retrieved from the Milk River Blogspot . Accessed February 11, 2014. “Theresa Lamebull–Gros Ventre (A’aninin).” Entry on Wikipedia, the free encyclopedia. Accessed February 12, 2014. Thompson, Ellen. “Elders Honored for Helping Keep Native Language, Traditions Alive.” Havre Daily News. February 4, 2005. Accessed February 16, 2014. Umbhau, Kurt. “Firing up White Clay.” Tribal College Journal. Winter 2009. Accessed February 12, 2014. Wipf, Briana. “State’s Native Languages Diverse.” Great Falls Tribune, June 30, 2013, 2. She did not go to school in Harlem. She went to school at St. Paul’s Mission, in Hyas, MT.